A popular holiday retreat, Sandanski is an internationally-renowned health destination situated in the foothills of the Pirin Mountains and is one of Bulgaria's best spa resorts. Sandanski records the highest number of sunny days in Bulgaria, and a combination of clean air, a mild climate, beautiful surroundings and natural mineral springs make it an ideal town for rehabilitation, recreation and spa treatments. The town is famous for its treatment of respiratory problems, particularly bronchial asthma, but the comprehensive balneo-climatic treatments also address numerous other conditions. 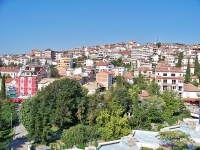 Sandanski is a small town in the Bistritsa river valley, with a population of around 30,000. The city centre is a beautiful place to walk around, with a number of restaurants, shops, hotels, art galleries and internet cafes. The town hosts several festivals throughout the year and is a point of departure to various attractions in the Pirin Mountains, including the sandstone pyramids in Melnik, the thermal hot springs at the Rupite volcanic crater, and the Rila Monastery. Shopping in Sandanski is concentrated in the city centre, with a number of shops, art galleries, and market stalls dotted around Macedonia Avenue. Popular Sandanski souvenirs include wooden toys and puzzles, local art, and clothes. There are also several ateliers who makes custom suits at prices far below those in other parts of Europe. Eating out options in Sandanski include a range of sidewalk cafes and outdoor restaurants. Many of the hotels in the city offer good places to eat, and most of Sandanski's restaurants are clustered around the city centre, within easy walking distance. Although renowned for its spa holidays, Sandanski boasts a surprisingly energetic nightlife, with a variety of clubs, lounges and bars to investigate. One of the main attractions of Sandanski is its proximity to the beautiful Pirin Mountains, which offer a variety of activities including hiking, visiting the numerous local wineries, and bathing in thermal hot springs. Other sights worth visiting are the sandstone pyramids in Melnik, the thermal hot springs at the Rupite volcanic crater, and the Rila Monastery. In town, you'll find an Archaeological Museum and a tranquil park featuring a lake with paddleboats and outdoor theatre.